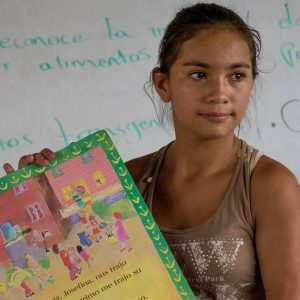 SOL operates three core programs in Nicaragua: Community Building Projects, Learning Resource Centers, and Scholarships. We have more specific focus areas within each of these programs, all aimed at increasing access to and conditions for quality education. We believe that a continued focus on these programs will help create access to education and improve the lives of students, adults, and communities in Central America. We pride ourselves on working in close partnership with local communities. Since our founding in 1991, we have continuously evolved our core programs to fit the needs of our partner communities. Empower and encourage broad community participation that allows for the community to develop ownership of the process and assure their continued commitment to the project. Achieve high impact, ongoing sustainability, and replication is built into all programs. Ensure that community organizing and development is not just a means to an end, but is fundamental in itself to the learning process. Encourage practical solutions to problems, using appropriate resources and technology, and encourage learning through doing. Inspire transparency, honesty, efficiency, care, and responsibility with resources. For more information, download our Program brochure.